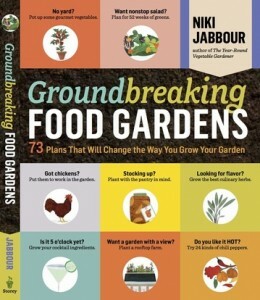 Groundbreaking Food Gardens (Storey 2014) by Canada-based blogger and garden writer Niki Jabbour is one of the best books for beginning (and experienced) food gardeners that I have seen in a long while. Subtitled 73 Plans that Will Change the Way You Grow Your Garden, Jabbour’s book plumbs the ideas of dozens of garden designers, writers and foodies to come up with a variety of approaches to growing food. Want to attract pollinators? She’s got a plan for that. Interested in raising chickens or keeping pigs near your garden? How about an heirlooms-only garden? Or one for canning, herbs, creating boozy drinks? How about a garden devoted to helping you save money on food or eat salad 52 weeks a year? She’s got you covered. Besides the variety of gardening ideas — truth is, it would be hard to select just one of these plans to implement — Jabbour offers drawings and maps as well as information from the designers to explain how the gardens should look and be cared for. The plans also include complete plant lists for each garden design. This is the kind of in-depth but not overwhelming information that beginning food gardeners want and need. Jabbour gardens near Halifax, Nova Scotia. While the ocean keeps her northern garden slightly warmer than our Minnesota gardens (she’s in USDA Zone 5), Jabbour’s book is filled with gardens that would work well in the North, including one for growing figs in pots. It’s a great book, and we’re delighted to have a copy to give away. To enter your name in the drawing, just leave a comment below (or on the MSHS Facebook page) telling us what your favorite vegetable to grow is. The winner will be selected randomly and we’ll announce the winner next week.